In this episode, we learn about new project from the department of educational psychology, where several EHS graduate assistants developed a tool designed to help teachers initiate productive classroom conversations around mental health and wellness, and in a way that’s fun, engaging, and educational for young learners. This is Reframe, The podcast from the College of Education, Health and Society on the campus of Miami university in Oxford, Ohio. Opening up about mental health is something that continues to be a struggle for many people. But it can be especially daunting for parents and teachers who are trying to understand the internal lives of young children, especially those who may not yet know how to best express themselves. Or why they even should. There has been a lot of discussion about mental health. And you can read the papers, you can watch the news, to figure out that we have a long way to go. And we are still trying find out what are some really good ways of tapping into what our young people are feeling and thinking about. And sometimes when you do like a paper and pencil survey, sometimes you get good results and sometimes you don’t. So, instead, what if there was a better way to engage young people about their mental state. A way that was perhaps a little more in line with the way young people would be more likely to engage with their surrounding today. What if . . . there was an app for that? Our growing cultural interest in digital engagement has bred apps that now cover almost every conceivable function. And because contemporary children are also increasingly accustomed to using smartphones and digital devices, it seemed to Witte, and his team of EHS educational psychology graduate assistants, like such a tool might already exist. But, it turns out, there’s not an app for that. The team did find several app geared toward adults. But there wasn’t really anything useful that was built for school aged children. That’s Sarah Bidwell, EHS educational psychology graduate student and part of Dr. Witte’s team of graduate assistants. And she’s right. Most experts would agree. There is a need out there. Issues surrounding mental health and wellness are clearly becoming a concern across society. In fact, “the statistics are staggering,” says Dr. Witte. So you have a lot of individuals that really have unmet needs. And kids are no different. But what’s important here is that we can provide good training. We can have the conversation. Teachers can model good techniques. And I think that is a start. Because that’s really not been part of the agenda in most classrooms that I have been in and it needs to be one now. The computer programing students were involved in a capstone class, which gives them an opportunity to gain actual project-based prince by interfacing with real clients that exist either inside or outside the university. Some of their recent projects included making apps for major organizations such as KeyBank and even NASA. And like all their projects, the mental health app was similarly coded from the ground up, built with a unique architecture specifically designed to address the concepts advanced by the educational psychology students. 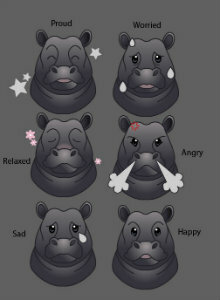 It beings by allowing children to first choose a cartoon zoo animal avatar, before identifying the emotion that best describes their current feelings. They can choose three positive emotions including “happy,” “proud,” or “relaxed,” Or three negative emotions, which are “sad,” “angry,” or “worried.” Next, a few simple follow-up questions will explore why they might be feeling the way they are. We want it to open the conversation between kids and adults about their feelings. Our first goal is to make the kids more aware of their emotions as they choose them day-by-day, and to help them understand that it is normal to experience a variety of feelings throughout the week. So we are thinking that this could also be a great communication tool and there’s a couple of ques that they would respond to get a sense of, well, has today been particularly hard? What didn’t work out well today? And we’ll start getting some kind of a little bit of a story about what’s happening for that person. That’s a great communication bridge for a teacher, who can then start being aware of the fact that, well, I have noticed that she hasn’t been bouncing around as much and has been kind of quiet. There may be something going on. And, once again, that can facilitate potentially a conversation at home as well. This would start to give teachers and parents some documentation of what’s happening for any particular student, and then, if it seems necessary, a school psychologist or a counselor could then be brought in as well. But ideally, in most cases, the app would be regularly used by an entire class and lead by a teacher who also explains why the activity is actually really important. So alongside identifying any hidden red flags, it’s also about normalizing a conversation around mental health and wellness, and at a much earlier age. So one of the app’s larger goals is to simply get everyone more involved, to help children understand that it’s okay to open up and start talking about mental health. We would make the argument that everyone needs to be educated about just good mental health practice. I think when teachers usually do things unilaterally across the classroom, it sends an important message that this is important for everybody and it creates a conversational opportunity to understand a little bit more. If you are targeting one or two individuals, I mean, that could be helpful in some cases. But first of all you are making a guess that that person is struggling or needs help, which may or may not be the case. But more importantly you are probably missing 4 or 5 other kids who are not showing up on your radar, who may need as much, if not more, help that then two who directly come to mind. So if you do it across the board as a classroom, it ends up being a classroom experience. And it valued or it would be viewed as valued collectively for the group. How Zoo You Feel? Should be completed in the fall of 2018. And Miami University’s department of educational psychology plans to make the app available for parents, teachers, and school districts as a free download.